I have always been a bit sceptical about East Anglia, following an unfortunate car breakdown in Great Yarmouth after a party in my university years. However, having married an Essex boy, I’ve had to rather reconcile myself to the fact that it’s actually quite nice there – and numerous sunny trips to the beach at Frinton with the kids have led me to the point where I was ready to take the plunge and go for a whole week. As usual, we spent ages looking at different websites before deciding on accommodation. In the end, Lower Saltings in Aldeburgh fitted the bill perfectly – close to the beach, a town with shops and plenty of food options and a nice house with some outdoor space. The reality was absolutely ideal – we were literally round the corner from the High Street, but with parking (which is at a bit of a premium in Aldeburgh), and we were also away from the noise of the sea front in the evening. The house was well equipped with dishwasher, washing machine etc and had a lovely secure garden with grass and decking, perfect for our girls to run around. It was a ground floor flat, so no stairs to negotiate and the main bedroom had an en-suite so the girls thought they were very posh having their own bathroom. It wasn’t really geared up for tiny children, but for our two, aged four and nearly six, it was fine. Aldeburgh is, quite simply, lovely. The High Street is full of independent shops, as well as a couple of chain shops such as Fat Face and Joules. There is a (rather cramped) Co-op as well as a bigger one a little way out of the centre. There are a number of fish and chip shops – all seem to be owned by the same people so the quality is consistent. Next to Aldeburgh Fish and Chips is a pub where you are welcome to take your fish supper into the beer garden as long as you buy a drink, and where there is also a cabin selling wood-fired pizzas (which were delicious!) We didn’t try any of the restaurants but the Lighthouse comes highly recommended and there is a Prezzo if you prefer to stay in your comfort zone – sometimes with children that’s exactly what you need. Running parallel to the High Street is the sea front. The beach is pebbly and banks quite steeply into the sea, so we didn’t spend massive amounts of time there. But we did walk up and down quite a few times – at the far end towards Thorpeness is the Aldeburgh Scallop sculpture in memory of Benjamin Britten. Walking back into town from there you pass the boating lake (for sailing model boats), the house used in ‘Grandpa in my pocket’ (which is a holiday let!) and the Lifeboat station which you can look around and perhaps even see the lifeboat being launched. There are also cabins selling fresh fish and seafood which means there are plenty of good options if you are self-catering. 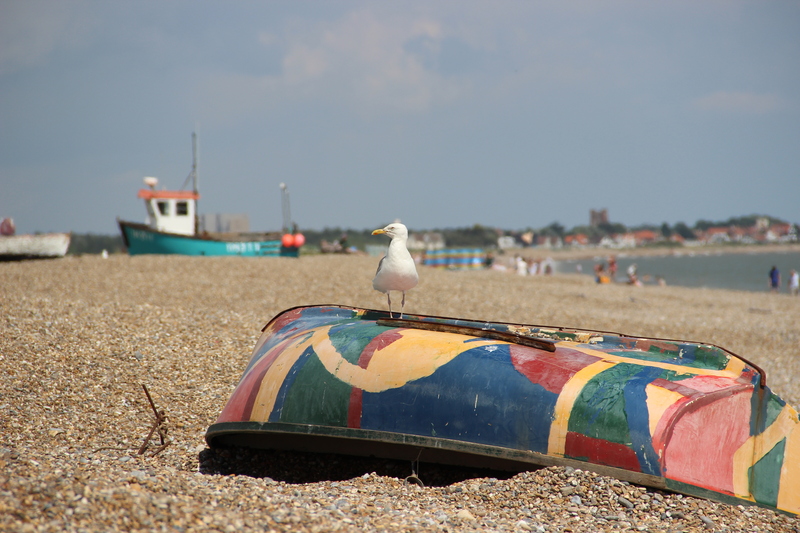 A short cycle ride from Aldeburgh along the coast is the village of Thorpeness. This is the home of ‘the House in the Clouds’, a fancified water tower/holiday let which you can see from Aldeburgh. 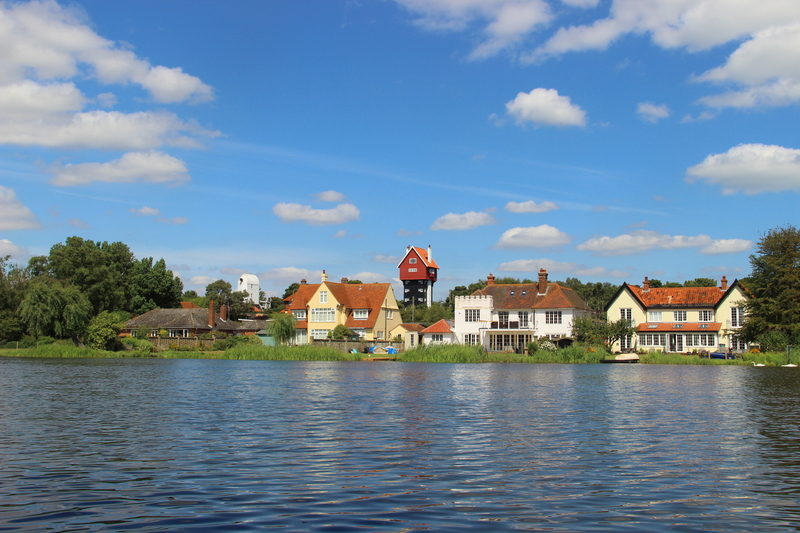 Also at Thorpeness is the marvellously quaint Thorpeness Meare – a boating lake where the advice in case of emergency is to…stand up – it’s only about 3 feet deep! We hired a rowing boat (they also have canoes), took a picnic and had a lovely time although I’m not sure the scenery change much while the girls were rowing! A little bit further afield is the village of Walberswick – home of the World Crabbing Championship. Unsurprisingly the main attraction is catching crustaceans. To the uninitiated, you need a net, a bucket, a crabbing line and some bacon – and not too much patience. Even less patience is needed if you do what we did and track someone else who is about to release their haul back into the water – just in time for the poor bewildered creatures to be caught all over again by us!! Crabbing was such a hit with our girls that we went on three days out of the seven. Walberswick also has a village green with a very small play park, and some little craft/gift shops for some browsing. From Walberswick foot passengers can catch the oar-powered ferry to Southwold – or you can just get in the car and drive there. This was our second trip to Southwold and just like last time we parked for free in one of the streets close to the pier – about 100 yards from the pay and display car park. 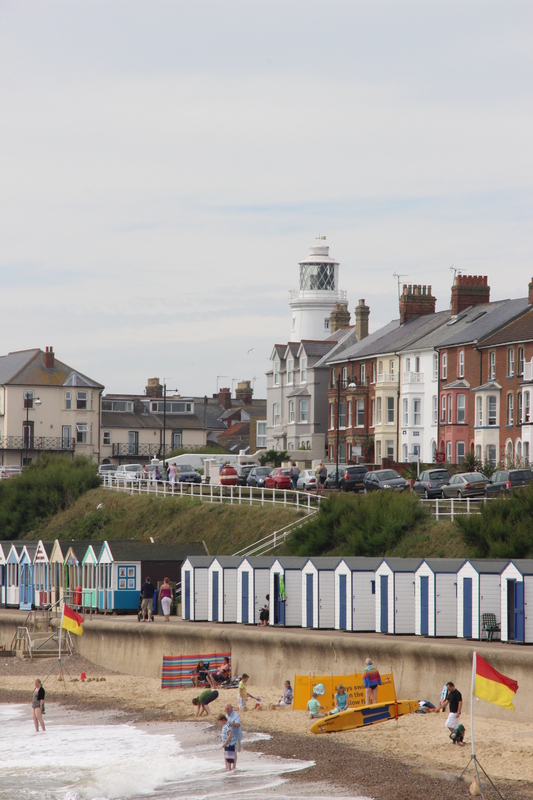 Southwold is another good place for ‘Grandpa in my Pocket’ sights with the lighthouse and Miss Smiley’s Cafe on the pier – but even without Cbeebies related attractions it is a lovely seaside town with a slightly sandier beach than Aldeburgh. We continued our retro holiday theme with a visit to the putting green which the girls took to with gusto if not precision. 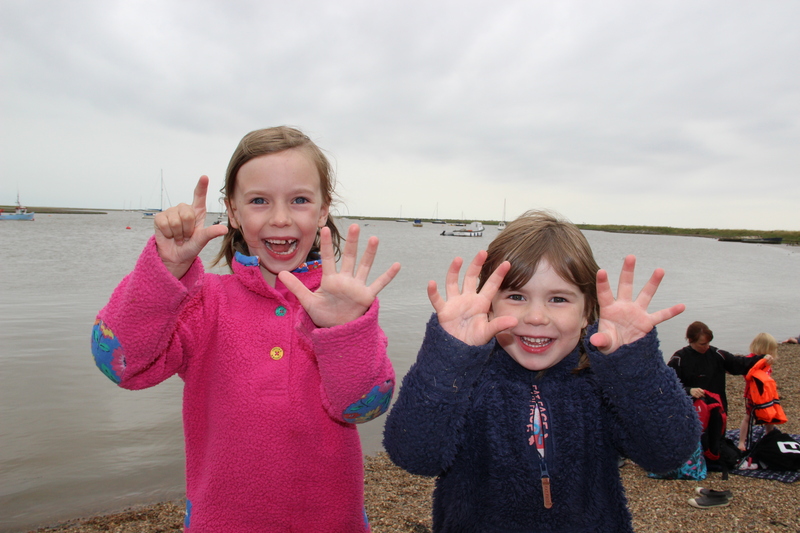 Our final destination for excursions was Orford, another pretty village with crabbing opportunities from the quay and good bird watching options if that is your thing. It also has some nice places to eat and a castle with good grounds for walking round and playing knights and dragons. On the road between Orford and Aldeburgh is Snape Maltings, with a concert hall and a number of speciality shops selling gifts and homewares – very nice for a browse, although not the most relaxing with children. There is much to see in Suffolk – the weather was so good on our visit we didn’t really have to try hard to keep the troops amused. So we didn’t explore Framlingham Castle, the Camel Farm, and the many pretty villages inland or visit any museums. It is excellent cycling country – my husband put his bike on the back of the car and then cycled home from wherever we were visiting while I drove home, usually with sleeping children in the back. And although both Aldeburgh and Southwold were clearly pretty busy they didn’t feel manically so as some seaside towns, particularly in the South West, can feel during school holidays. So although it pains me to admit it, East Anglia is, to coin a phrase from the girls’ current favourite film, practically perfect in every way. This entry was posted in Destination guides, UK and tagged Lower Saltings, Southwold with kids, Suffolk family holidays, Suffolk with kids. Bookmark the permalink.